Synopsis: The Revolt of the Black Athlete hit sport and society like an Ali combination. This Fiftieth Anniversary edition of Harry Edwards's classic of activist scholarship arrives even as a new generation engages with the issues he explored. 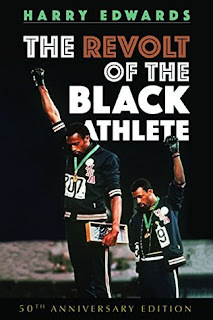 Edwards's new introduction and afterword revisit the revolts by athletes like Muhammad Ali, Kareem Abdul-Jabbar, Tommie Smith, and John Carlos. At the same time, he engages with the struggles of a present still rife with racism, double-standards, and economic injustice. Again relating the rebellion of black athletes to a larger spirit of revolt among black citizens, Edwards moves his story forward to our era of protests, boycotts, and the dramatic politicization of athletes by Black Lives Matter. Incisive yet ultimately hopeful, The Revolt of the Black Athlete is the still-essential study of the conflicts at the interface of sport, race, and society. Review: A book that takes dedication to read, but is worth it. Very informative. I'm finding lately that I know too little about the history of black people in this country, and have been making an effort to seek out books such as this to educate myself.